We travelled to Youghal, a day early, to attend a seminar on witnessing to Muslims, at Cork Baptist Church. This proved useful later in the week. 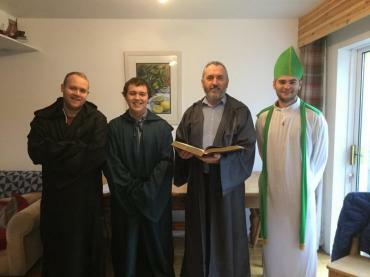 We also used our extra day to prepare a gospel-focused drama on St. Patrick which we performed in a primary school, in the village of Inch, to students and staff in eight classes. Much of the work was outdoors, so we were grateful for the dry weather. We delivered hundreds of 4You.ie magazines, Halloween-themed tracts and Coaching4Christ DVDs. The DVDs were well received and both children and parents spoke enthusiastically about that outreach. Other team members did street evangelism - playing music, offering Christian material and chatting. Five team members recorded their testimonies to be broadcast on CRY 104FM community radio over the coming months. Friday night in Youghal was the start of a Halloween-themed weekend. We handed out tracts and had one-to-one conversations with some of the organisers during the opening ceremony. On Saturday, we travelled to the local Farmers' Market in Midleton where, thanks to a local Christian contact, we were able to give an open-air performance of our drama. Later that afternoon, back in Youghal, we went to the studios of CRY 104FM where Paul arranged for us to perform it live on air. During our stay we had opportunities to witness to Mormons, Muslims, Jehovah’s Witnesses and a priest. We led the Sunday service and preached at it, too and also spent half a day in Cork City doing street work. The hospitality was legendary! The McFarland family opened their home to us daily - feeding us, preparing outreach materials, planning for the day ahead, etc. We learned a great deal about Christian hospitality from this young family.